There are two finishes available for outdoor concrete. We would strongly recommend going with the honed concrete instead of the grind and seal (G&S) for several reasons. The only limitation to the honed concrete is that it is only available in a matte finish, so if you want a higher gloss then you might consider a G&S, however it then does come with certain risks which are explained further down this page. The main difference between a honed finish and grind and seal are the sealers that are used. The honed finish has a penetrating sealer which absorbs into the slab (like sunscreen on skin, it penetrates down into the concrete rather than sitting on the surface). This penetrating sealer cannot be scratched off or worn down by foot traffic and therefore will last much longer, whereas the sealer used for the grind and seal (G&S) option is a topical coating (like a clear nail polish) which can be scratched / damaged / gouged and will wear away over time depending on the type and volume of foot traffic. A honed finish is easy to repair, and only minimal maintenance should be required to maintain this finish. For a G&S however, this finish is not able to be easily patch repaired and will most likely require more frequent and extensive maintenance overtime due to the topical coating being far more susceptible to damage from normal day to day life. Beautiful, timeless and easy to maintain this finish is what we would strongly recommend for most outdoor concrete areas. You can choose to have it in a nil, minimum or full stone exposure look. Click here for the full honed concrete page. Although hugely popular indoors, we don’t often recommend it outdoors unless the client is wanting a glossy look. This G&S option is available in a matte, satin or gloss finish. For a G&S in an outdoor area, we would add a non-slip grit to the topical coating to ensure some slip resistance when wet. Although the Grind & Seal finish may not be suited to your outdoor areas, it is a great option and something we would highly recommend you consider for areas such as your garage floors, or anywhere else that may be prone to oil / liquid spills. Please click here to go to the full G&S page. If you are considering a G&S for your outdoor area, please contact our office to speak with one of our team members to ensure that it is the right option for you. Factors such as the volume of foot traffic or the slab meeting up to a grassy area may mean that a honed finish is more suitable for your slab. 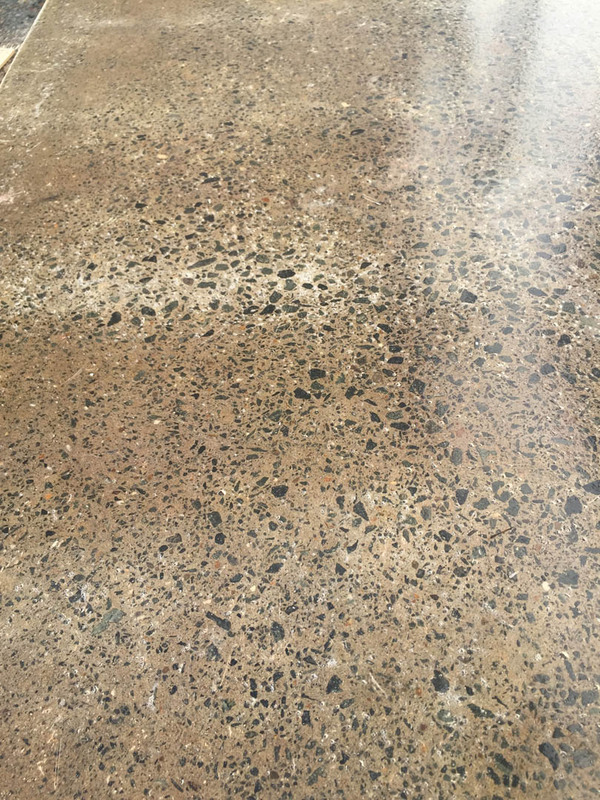 There may be potential issues of moisture becoming trapped between the slab and the topical coating, which can not only cause visible and unsightly discolouration, but also the coating may fail and potentially delaminate from the slab. Please see the below pictures for examples of this.